Lee, you must be delighted to achieve what you did this year ( 2000) at the TT after your personal tragedy? Delighted, yes. Relieved, definitely. We took an early decision to carry on with the team, but being the eldest of two I was always conscious that I was putting Neil and the rest of the team in a corner by going racing again. It raised questions such as 'Was it too soon?' and 'Were we up to it?'. I wanted it badly as did Neil, but I'm a bit of a bully in ways, whereas Neil is a little more reserved than I. If we hadn't have got a result, I'd have felt so responsible. But, as it is I have achieved so much more this year than I have in the previous years of my life put together. With John (McGuinness), Jason (Griffiths) and 250 Supercup rider Adrian Clarke we have entered eleven races and haven't finished outside of the top four in any of those races with no DNF's. Although the Singles TT needed more depth of field, Iam 100 per cent certain that we would have beaten any rider/machine combination had we been put under enough pressure. Both of our riders had a lot in reserve at the Island this year. As you can imagine though, each race creates some sadness for us as we are doing this through unfortunate circumstances. A rider commented at Assen recently how lucky we were to have our set up compared to his more modest outfit. He wasn't being horrible, but we are far from lucky to be in this position. It's my first experience of meeting someone who is perhaps a little in awe of our success, but hasn't given due credit to our circumstances. How early on in the year did you decide that you were going to undertake the project, in your parents name, and bring a race team to the TT? I practised my FZR 400 two weeks after the funeral at Thruxton. Despite what had happened, it was another reminder of how much I love bikes. Neil and I talked about it on the back of a conversation I had had with my Mother Alison about running the Team again to defend Dad's title. It may be hard to understand for some people, but having our Mum and Dad taken away from us was painful enough. Then, to take away something which we had been involved in our whole lives was another blow we couldn't bear. Being involved in racing gives us a lot of life. We had a lot to deal with all at the same time. There was the memories, sorting riders, team personnel, obtaining the vital sponsorship. I'm pleased to say that Neil and I with a lot of help seem to have got it just right. Tell me about the AMDM Machines themselves. Are they based around the bike your father rode or were they totally new? 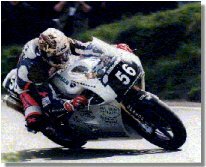 The machine ridden by John McGuinness at the TT was Dad's original No.1 machine from 1999; the British Supermono Championship Winner. Jason's machine was a replica built in 2000. Be it a biased opinion, the machines are magnificent, real works of art. You could say no stone was left unturned in my Father's quest for a truly competitive machine. The bike was a new project between Mum and Dad and Harris Performance begun in the 1999 New Year period. In the end, the bike was completed on the Wednesday of practice week for TT 99. Due to the terrible weather that week, the bike never completed sufficient practice time. So, the original Chrysalis BMW was raced by Dad, the machine he had won two TT's on previously. It's fair to say Dad was pretty disappointed because the bike was built specifically for the Island. When the team returned to the Island, Dad finally got some good mileage in on the bike. He finished the season on that machine winning the British Championship. I remember Dad saying that the bike could do 113mph average at the TT no problem. 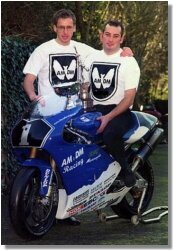 After Mum and Dad died we had his machine rebuilt save the engine which had won the 1999 TT. We also began to build a replica machine. All this as a four way project between Ricky Hunt of Carbontek International who assembled and completed both of the AMDM's. Gary Cotterell of GRC Tuning prepared the engines on the back of work already completed by my Father. Harris Performance constructed the second chassis and the Chrysalis Team including Neil and I filled in the gaps. I must thank Pete Rogers of Carbontek International who introduced me to Ricky Hunt. Ricky said from day one how hard it would be to create a replica machine. But, he completed the job and now there are only two in the world. I believe the motor is a BMW. Do you receive any assistance from the factory? At a time when many were looking to support us in the wake of a terrible week, one that didn't was BMW (GB). BMW claimed before and after Mum and Dad's death that they didn't support Motorcycle Racing, that it wasn't the right corporate image and initiative. 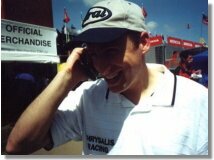 However, they were quick to claim credit for three consecutive TT titles achieved by David Morris in 1997, 98 and 99. It wasn't that they didn't support the team in those years, but the reward for the manufacturer against the financial support offered to the team was not comparable. Strange that BMW didn't help us in the wake of the loss of one of their strongest ambassadors in Motorcycle Sport, if not the strongest. But, we may not have been able to achieve the success of this season without Honda UK. Ironically, Bob McMillan and Roger Harvey came forward to help the team when they could not hope to achieve notoriety for the manufacturer they represented. A testament to the individual support of the two and the dedication of Honda towards Motorcycle Racing and the Isle Of Man TT. So, all this considered the bikes were named the Chrysalis AMDM machines to bear our late parent's initials. In truth, the bikes were far from BMW's anyway. In 1994, the first year of the project the Rotax/BMW engine was pretty much standard. By the end of 1995, Dad was throwing pieces away from the engine and designing, manufacturing replacements. When he died, the Gearbox, Con Rod, Piston, Cylinder, Cylinder Head and Cam Shafts were all designed, manufactured or commissioned by him. The crankcases look standard, but have been extensively modified. For 2000, the four engines were assembled by Gary Cotterell. The remainder of the bike is non standard, no BMW F650 parts are used, not one nut or bolt. Dad wanted to win so badly that he hand machined four cylinders from solid billet aluminium. It took him a combined 1500 hours work to create them. Hence, why we can confidently state that the machines are far and away AMDM more than BMW. Which goes some way to cushioning the blow of their lack of loyalty. Jason Griffiths and John McGuinness rode the bikes for you at the TT. How and why were they chosen? Neil and I drew up a list of riders we felt suitable to ride the bikes in the Singles TT. We then completed a kind of scoring system to determine the most suitable two riders to ride for the Chrysalis team. In the end, two of the top four were John and Jason themselves. Others on the list included Jim Moodie, Ian Simpson, even Joey Dunlop. By this time, Bob McMillan of Honda UK had been in contact with us and pledged his support as well as checking all was well with us. We asked if he could suggest some riders for the team and came back with John's (McGuinness) name. After talking to the relevant parties involved, John McGuinness signed for the team. Bob (McMillan) offered some other riders too, but we wanted to see who we could obtain. Yvonne Ward had been in contact with us regularly to see how we were coping, empathising with our situation following the loss of her husband Steve to a Motorcycle Racing accident. She was vital to us with her in depth knowledge of the TT and suggested that she talk to Jason (Griffiths) on our behalf. Within weeks, Jason had also joined the team. Both riders we can now call friends. John attended Mum and Dad's funeral and comes down to visit us as and when he can. He is an awesome rider and really good fun to be around. Jason is such a professional. It really didn't bother me who won out of our two riders, but I know Jason was disappointed with his tyre choice in the wake of indifferent weather prospects on race day. Had circumstances been different, I think he would have pushed John harder. I was really pleased he came on board with us. Dad thought he was a good rider and was really pleased Jason had such a good TT in 99. He'll hate me for saying this, but Jason is one of the best modern riders never to have won a TT. And they certainly did the business for you didn't they? Many people felt that John was going to walk the race. All the headlines related to John or us, not really Jason. Several riders wanted to be our other rider, but we wanted someone likeJason. I knew he was capable of running at the front and it was only his tyre choice that let him down a little. He's a great team player and has ridden for us three times since the TT. I'm really proud and pleased for Mum because we raced on despite all the trauma. I'm happy also that we kept Dad's run going, it's nice to make it four in a row as a team. It's also the seventh and eighth TT rostrums in seven consecutive years. Whether we will be back again next year with the AMDM's is uncertain. The bikes are very capable of breaking records if pushed hard enough. Dad used to hate hearing the excuses of other riders as to why our bikes couldn't be beaten. Because other riders machines broke down, we would hear things like 'If the bike had kept going, Morris may well have finished runner-up'. But, ask the question as to why the machine's were running so close to breaking point or rider's attempting ambitious strategies to win the race. Because they all knew how dominant, consistent, reliable and fast the Chrysalis/David Morris package was. We hope we can continue to prove that with whoever we work with in the future. You must be very proud of what you have achieved. Thanks for taking the time to talk to us an all the best for the future. The younger brother of Lee, Neil Morris is the other half of the Chrysalis Racing Managerial Team. He owns a successful PR and Marketing firm and is the perfect person to deal with the press side of the team. Neil, your in charge of the PR side of the team. I think everyone would agree that you have done a superb job of presenting the team and the machinery. I hope so. We make a concerted effort to present ourselves in a professional manner. But, the efforts made are not just to do with how we look. We take pride in how the machines are prepared as well as how we keep our sponsors and supporters informed and recognised as much as is possible. It's such an important part of the mix and I think that's perhaps what helps us to stand out from other teams. We are very conscious of putting the team somewhere where we can make the best impact, which is why we are likely to compete in a different class next season. The Singles series in Britain is struggling compared to previous years. We have displayed our loyalty to the class since 1992 and have given the series some welcome exposure as well as some remarkable achievements. But, we have to be realistic. It was extremely difficult to gain the vital sponsorship needed for this year's effort. Partly, because people doubted our character in the face of our personal tragedy. But, mainly because the Singles series doesn't offer enough exposure to potential sponsors. I worked very hard against these odds this season. We featured on BBC, ITV, Channel 4 and Satellite television this year. We were also given due credit in all the normal Motorcycle avenues such as Motor Cycle and Bikesport News, Radio TT and so on. But, I'm more than aware that I was able to obtain this kind of coverage due to our sad losses. The Media were very kind to us at a time when they could easily have sensationalised our situation. But, next year will be different again and we have to be competing in a series that gives due credit to our sponsors and supporters. Hence, the plans to race at British Supercup next season alongside another TT effort. With Motorcycle Racing getting more and more exposure in the general Media, it's so important to create the right image. Now for next year I believe you are considering a new direction for the team? That's right. As I have touched on already, we are currently in the process of talking to major manufacturers as well as looking for financial and product support from existing and potential new sponsors. All this with a view to competing in the British Supercup series in 2001. No decisions have been made as yet, but the hope is to compete in either the Supersport 600 series, Superstock 1000 or the new Superstock 600 series for riders aged 16-23 years old. Each class has its pros and cons. The Supersport series is the pinnacle of British Bike Sport, only surpassed marginally by the British Superbike series. But, it carries a hefty expense and would be a major challenge. The two Superstock series offer the opportunity to continue our learning curve in the Sport. At a relatively low cost in comparison to the Supersport 600 series, we can enjoy an ease to the pressure of competing in the blue riband class whilst enjoying what is an extremely competitive Production class. Both Superstock series are relative, but the 600 series is an attractive prospect for us to bring a young rider through the ranks and further establish the Chrysalis Team. I'd like to think we could go on from our successes this season and show our mettle at the highest level. In years to come you may see Chrysalis Racing as a major force in British and potentially World Superbikes. Who knows. We have the ambition and the drive to go further. All we need now is the break and the support to do it. Will the TT still be including in Chrysalis Racing's calendar? We'd like it to be. It's out of our hands really. If sponsorship is forthcoming and we have the full backing of a manufacturer to compete at the Island alongside a British Championship effort, then no problem. Lee and I would like to run Chrysalis at the Isle Of Man again. But, we need to be competing in an additional or different class. The AMDM machines are unlikely to be sold, so if things fall into place and we are completely happy with the idea, we will run them again. But, we would prefer to push our abilities in a different class and that would realistically mean one of the Production based classes. We feel we could achieve equal or more success using different machinery and it's an ideal opportunity to prove that. It's all too soon to call. However, if all is as we need it to be, we'll be at that Island again. And what about the AMDM machines? Will they be ridden competitively again? As I've said, who knows. It's a popular cliché, but you can never say never in racing. Lee and I have not made any decisions. The bikes are obviously very sentimentally important to us. But, there is also the small matter of a class lap and race record to consider. It's the only major ambition unfulfilled by the AMDM machines. Conditions and circumstances just haven't allowed the records to fall previously. But again, we'll see. They're certainly competitive enough for another onslaught. Have you got any riders in mind for when your new venture starts to take shape? We've enjoyed the company of some wonderful riders this year. John McGuinness and Jason Griffiths have been with us all through the AMDM project and have been a joy to work with. As has Adrian Clarke who has raced for us in place of McGuinness who picked up an injury this season alongside his commitments to the Honda factory. However, I don't know who we'll be working with in 2001. If we run in the Supersport 600 series, we must take a rider on board who can run well in what is a highly competitive class. Superstock 1000 is a similar prospect after a hotly contested 2000 series was won by David Jefferies. If we run the team in the new Superstock 600 series, we need to look seriously at running a rider who can really look to make his mark on the future of British Bike Sport. The series is an ideal way to take on a young rider and push him towards major success. We would hope to take some guidance from whatever manufacturer we decide to work with next season. But, for now we have kept our eyes open to a few prospects. Both Lee and I have travelled to other meetings and have obviously seen many riders this year and in previous years. We will make a considered decision including all the important parties and we'll see what goes on from there. Well as I mentioned to your brother, you must be very proud of what you have achieved so far. We wish you all the best for the future and finally are there anyone you would like to thank? Certainly. We'd both like to thank all those who have been involved in our efforts this season. We've had a tough year to get through and we both know we couldn't have done it without the help of people like Steve and Chris Caffyn of All-Way Surfacing, Autotekk Paintwork, BKS Leathers, BLMT Composites, Brenmar Electronics, Carbon Tek International, DC Chains, Daytona Boots, Dunlop Tyres, EBC Brakes (Freeman Automotive), GRC Tuning, Goodridge (UK) Ltd, Harris Performance, Multijac, NGK Spark Plugs, PFM Brake Discs, Phoenix Distribution (Arai Helmets), Rob Willsher Motorcycles, SETA (Southampton Engineering Training Association), SPC Motorcycles, SignTec Graphics & Signs Ltd, Silkolene Lubricants , Wiz Racing Products and also Bob, Roger and Helen at Honda (UK). There are many more besides including the riders and the Chrysalis Team members of course and not forgetting those who watch our efforts trackside. We look forward to again working alongside all these people for the forthcoming season.